Hi, I’m trying to figure out how to import my contacts from iPhone 4S to my MacBook. I already managed to import the photos as iPhoto popped up automatically, but the contacts seem to be more tricky. Appreciate your help! When it comes to importing contacts from iPhone to Mac, iPhone users will think of using iTunes at first, but iTunes will not be helpful at this moment. As iTunes backs up the data to computer as a whole database, and the users are not able to view them on computer, let alone extract certain files from the backup. Users will need to take advantage of the third-party iPhone contact transfer software. Users are able to find an app called My Contacts Backup in the App Store, and this app can help users to transfer contacts from iPhone to MacBook. In fact, with this app, users are able to send their iPhone contacts to email, and then decompress the contacts on the MacBook.iPhone users are also able to use PC programs to import contacts from iPhone to Mac. Here we are introducing two iPhone contacts transfer programs for you. The programs that provide the function of backing up iPhone contacts are mostly iPhone data recovery applications, as they can export files from iPhone to computer, or extract data from iPhone backup. Leawo iOS Data Recovery is one of these PC programs. This software enables users to export up to 12 kinds of files from iOS devices and iTunes backups to computer, and it is easy to use. The following guidance will show you how to transfer contacts from iPhone to computer with Leawo iOS Data Recovery, and you are allowed to free download this software to have a try. Note that the trial version will stop at the preview window. 1. 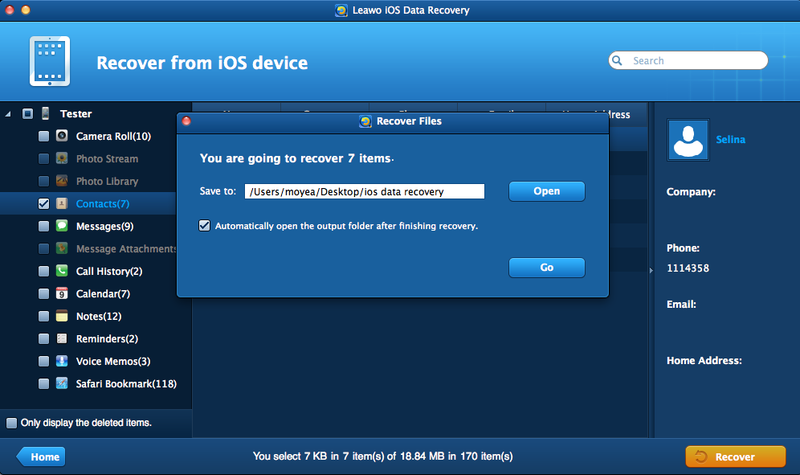 Run Leawo iOS Data Recovery, and you will see two recovery modes in the main interface: one is “Recover from iOS Device”, and the other is “Recover from iTunes Backup”. Choose the former recovery mode and connect iPhone to computer with the USB cable. 2. The software will recognize your iPhone and check it in the bottom list. Click the “Start” button in the window, and then the software will begin to analyze your iPhone. 3. The software will scan the contents in your iPhone when the analysis is done. 12 categories are listed in the left sidebar. When the scan is finished, choose “Contacts” and then the contents will be shown in the right part. Check the files you need and click “Recover” at the right bottom of the window. 4. After clicking the recover button, you will see a pop-up dialog. Click “Open” in the dialog to choose a folder on your computer to save the exported files. Then click “Go” to start importing contacts from iPhone to Mac. 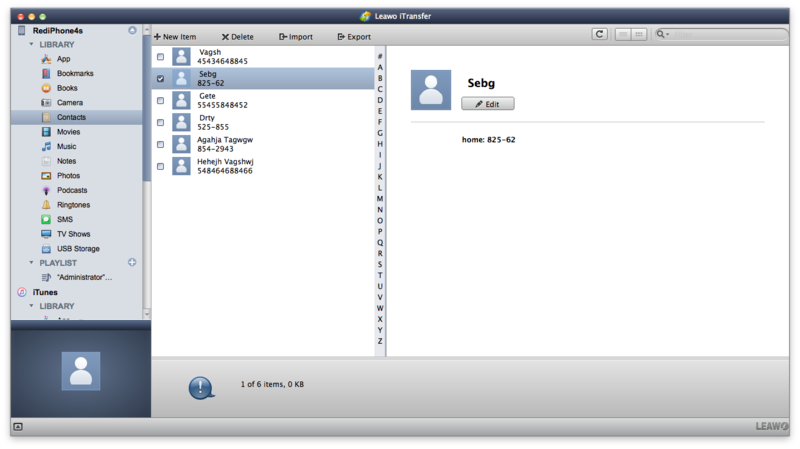 When the importing process is done, you will see the exported contacts in the target folder. The contacts are saved in a VCF file, a CSV file and an HTML file, which are all viewable on your MacBook. You are also able to export contacts from iPhone backup to MacBook with Leawo iOS Data Recovery, and the following guidance will show you how to do it. The main function of Leawo iOS Data Recovery is to recover deleted files from iOS devices, and it helps users to recover 6 kinds of deleted files from iOS devices, for example, users can restore iPad from backup with the help of this software. 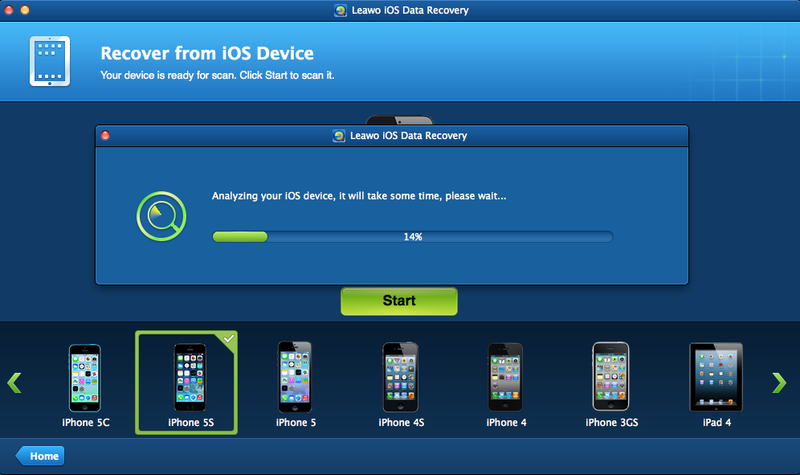 If you are interested in Leawo iOS Data Recovery, just free download it and have a try. Apart from iPhone data recovery software, I would like to introduce Leawo iTransfer for Mac if you don’t know how to transfer contacts from iPhone to Mac computer. This software is used for transferring files among iOS devices, iTunes and Mac computers, and it will help users get rid of the sync of iTunes. The following guidance will show you how to sync contacts from iPhone to Mac. You are allowed to free download the software to have a try, note that the trial version has limited transfer times. 1. Run Leawo iTransfer and connect iPhone to computer with the USB cable. The software will automatically detect the libraries of the iPhone, and display the libraries in the left sidebar. 2. Choose “Contacts” library in the sidebar and the contacts will show up in the right part of the window. And you can choose the contacts you want to transfer. 3. Check the contacts and click the “Export” button at the top of the window, and choose the file type you want to save on your computer. Then a window will pop up, and you need to name the exported file before the software starts transferring contacts from iPhone to Mac. When the transfer is finished, you will get the contacts in the target folder. The contacts will be saved in vCard files, and iPhone users are able to import them into iPhone again with Leawo iTransfer for Mac. 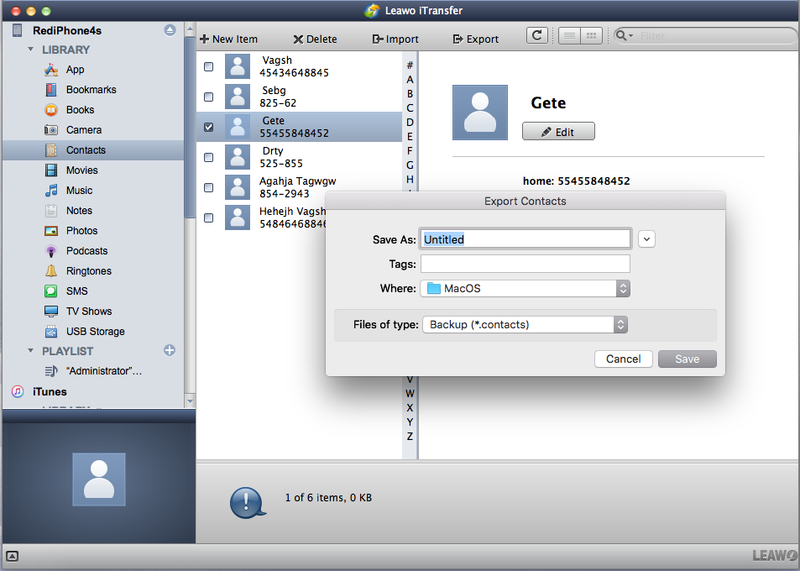 The video tutorial below is about how to sync contacts from iPhone to Mac with Leawo iTransfer. Check it out if you are in need.